If your truck does not currently have a truck rack, you are missing out! Truck racks, the metal attachments that are fitted to the back of a pickup truck behind the back window, provide invaluable protection and support for working trucks. If you are regularly carrying loads in your truck, or are hauling large items, without a truck rack, your truck and your safety as a driver are at risk. Here are five benefits of truck racks that you need to consider. Truck racks don’t look like they provide that much protection, but stop and think about what they really do. When you have a truck rack, items carried in the truck cannot hit the back of the cab. Also, if the items extend above the cab, the rack protects the paint by keeping the items off of the actual top of the cab. With a truck rack, you can carry more without fear of scratching paint or damaging the back windows. A truck rack allows you to stack things in different levels. Consider, for example, a contractor that needs to transport lumber and ladders to a job site. With a truck rack, those items can be stacked, securely, on top of one another, without risk of them falling out of the truck or causing damage to the truck. Depending on the design of the rack, a truck rack could double and even triple your cargo space. If you are serious about hauling things with your truck, you need a truck rack. A truck rack also increases cargo space by allowing the truck to haul long items that would not normally fit in the bed. 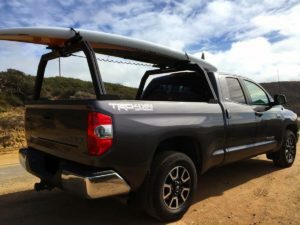 Instead of having these items hang out the back end of the truck’s bed, with the tailgate open, a truck rack allows them to be stored above the cab of the truck, securely tied to the rack without risk to vehicles behind the truck. A truck rack provides protection for the back of the truck in the event of a rollover. Today’s truck racks are designed to withstand the stress of a rollover without crumpling. This means they provide more stability to the cab of the truck, as the rack can take much of the pressure form a rollover and prevent the cab from folding in. It also helps limit the risk of the back window breaking in a rollover. Truck racks seem as though they are designed to protect the truck, but they also protect the driver. The rollover protection, for instance, helps limit the risk to a driver in a serious accident. These racks also prevent items from breaking the rear window, and thus entering the cab and putting the driver at risk. Some racks can reduce glare in the cab, improving visibility for the driver and improving the overall driving experience. While aesthetics is a minor benefit, it is still a benefit. When you install a truck rack on your truck, you instantly give the impression that the truck is ready for work. Trucks without a truck rack do not have the rugged, work-ready look you may be going for. In light of the other benefits of truck racks, aesthetics is like the icing on the cake. If you are in the market for a new truck rack, Magnum has your truck rack/headache rack needs covered. Browse our extensive selection of truck racks today, and find one that is the right fit for your truck. Soon you can be benefiting from the extra cargo space, added protection and aesthetics of a durable, high-quality truck rack.